Contact lenses are an ideal solution for people who don't want to wear glasses, whether they find them bothersome or they don't like the way they look in them. You can choose to wear them as your primary eyewear, or you can wear them only for special occasions. At Kozlovsky Delay & Winter Eye Consultants in San Antonio, we help patients decide if contacts are right for them and fit them for the correct lenses. As optometrists, we know aesthetic purposes are the most common reason people get contacts. However, they're also more convenient for some people than wearing glasses. Additionally, they're much cheaper to replace than glasses if you should happen to break or lose them. Because they move with your eyes, you get less distortion when you see. You also don't have the frames distorting your view. They don't fog up, nor do you have to worry about mud or rain accumulating on them when you go outside. 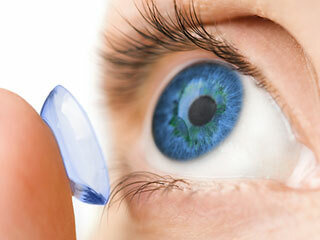 For some people, the vision correction provided by contacts is also better than with eyeglasses. Every eye doctor at our clinic is either an ophthalmologist or optometrist. We're all available to provide you with an examination and measure you for contacts. Every optometrist on our team understands the advantages and disadvantages of contacts and can educate you so you can make an informed decision about vision correction. The first step to getting contact lenses is to have an eye doctor from our clinic conduct a comprehensive vision examination. During this part of the visit, our eye doctor will have you look through a set of lenses that allows you to see letters. You will read the lines until you find the one that appears the clearest to you. Next, we perform an exam to diagnose astigmatism and determine the degree you have. This portion of the test consists of our eye doctor having you look at two different images in the lenses, and then you have to inform us of which one looks clearer to you. This part of the test determines your prescription strength. The next part of the test is where a doctor of optometry has you look into a machine that checks the dimension of your eyes. This gives our doctor the correct size for your contacts, so they fit in your eyes properly. If this is the first time you've had contacts, we will educate you on how to properly take care of them. Schedule an appointment with one of our doctors of optometry at Kozlovsky Delay & Winter Eye Consultants, serving San Antonio and the surrounding region, for a contact lens exam.